An official joint-use agreement not only details civilian and military operations at CHS, it also outlines the maintenance of its airfield pavements. 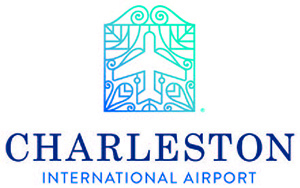 The Department of Defense owns and maintains the two runways (9,000 feet and 7,000 feet); and the Charleston Country Aviation Authority is responsible for the taxiways and apron areas throughout the airport. In June, the Authority finished a major taxiway improvement program that dovetails with the runway reconstruction the U.S. Air Force completed three years ago. Originally budgeted for $24 million, the taxiway project was completed for $19.8 million. "Although the taxiways looked fine visually, we had to take action because we detected increased spalling and cracking," explains Hernan Peña, the Authority's vice president of Engineering. "We knew something had to be done sooner rather than later." The airport consequently reconstructed three taxiways, installing new pavement, improving drainage and upgrading signs and lighting with new LED fixtures. The project also aligned the hammerhead (i.e., taxiways A and A1) to join Runway 3-21 at a 90-degree angle. Each of the renovated taxiways includes a 6-inch lean concrete base topped with 17 inches of new concrete. Taxiway A alone is more than one mile long and 75 feet wide, with additional 30-foot asphalt shoulders on both sides. Peña explains that the aging taxiway pavement needed to be replaced to ensure that the state's busiest airport is prepared for continued growth in passenger traffic. In 2016, the airport served more than 3.7 million passengers during its busiest year on record. CHS officials anticipate reaching the 4 million mark by the end of this year. Many of the taxiways have been around since the airport terminal was built 32 years ago, notes Peña. "While still sound due to outstanding maintenance, it was time to replace them to ensure many more years of service," he explains. 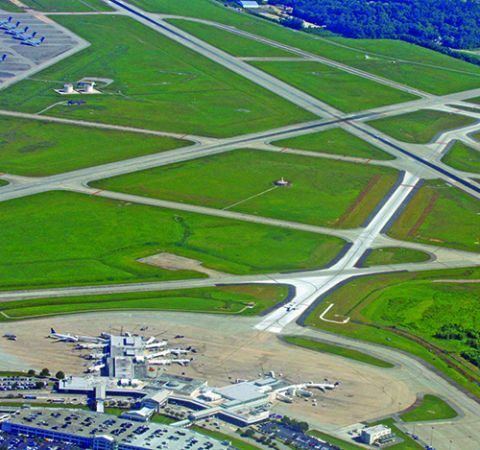 The project team cites detailed planning and an abundance of communication as key factors in completing the taxiway renovations ahead of schedule and under budget by more than $4 million. Construction began in January 2016 and ended in April of this year-partially overlapping with the $200 million top-to-bottom terminal redevelopment project completed last October. During planning, CHS officials emphasized the importance of completing the taxiway work without disrupting the airport's 130 daily commercial flights and other operations by the Air Force and Boeing. The airport's engineering firm of record, ADC Engineering Specialists, designed and oversaw all construction administration and worked with the project contractor, Anthony Allega Cement Contractors. "We were very fortunate to have an excellent contractor-one of the best that I've seen," says Peña, reporting that crews were focused and efficient, working with hardly any delays. "As a result, they were able to bring the project in under budget, which was a benefit to all." Throughout the 17 months of construction, airport officials shut taxiways down in phases so the project could proceed without disrupting airfield activity. Rerouting ground traffic to other taxiways allowed crews to work during the day, rather than restricting them to after-hour and overnight shifts, explains Britton Corbin, the airport's Engineering director. Although contractors lost about a week of construction time to Hurricane Matthew, they still managed to complete the project about one month ahead of schedule. "Communication really was the key in the project," Corbin reflects. "We had participation from all our partners. Everybody knew what was going to happen and when it would happen. This allowed us to work efficiently, respond to any issues and adjust schedules quickly and as needed." 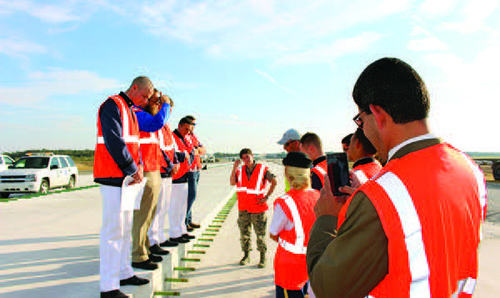 It's not often that a construction site qualifies as a field trip, but that's just what the CHS taxiway improvement project was for cadets from The Citadel, which is located just 10 miles from the airport. Last fall, 11 juniors enrolled in a transportation engineering course at the esteemed military college were invited to see how the principles and construction techniques they were studying on campus are applied at an active construction site. They also toured the air traffic control facility to further broaden their exposure to airport operations. Support for the tours radiated from the very top of the airport's organizational chart. "At the start, we thought this could be an interesting out-of-the-classroom experience that the cadets could learn something from," says Paul Campbell, executive director and chief executive officer of the Charleston Country Aviation Authority. "Pouring a concrete taxiway is unlike constructing any building, roadway or transportation network. The pavement must be capable of withstanding the weight of fully loaded commercial airliners, military aircraft and the Boeing Dreamlifter and Dreamliners." Peña and Corbin, both Citadel alumni, personally supported the initiative to bring cadets to the CHS jobsite. Phil Strope, a senior engineering specialist with ADC and another Citadel graduate, also facilitated. During the tour, they provided direct insight about taxiway pavement, deployment of heavy equipment, and quality control of construction materials, and also discussed the roles of engineering design and construction supervision. While Campbell is a proud Clemson Tiger, he is confident that having Citadel Bulldogs on hand made the event more meaningful for the cadets. "I am an engineer and a big believer in letting students learn what the real world is like," he says. "They experienced firsthand what it's like to work as a team with professionals from a variety of construction and engineering fields. Who knows, maybe someday, some of those cadets will come to work at the airport or work for one of the contractors." One cadet who is considering an aviation career track in the Army described the tours at CHS as eye opening. Another who was hoping to land a summer internship with Boeing said he looked forward to the field trip for weeks. Citadel cadets and recent graduates have secured several of the 10-week airport management internships CHS has offered for the last three years. Beyond its impact as a valuable teaching tool, the recent taxiway project at CHS is expected to deliver lasting effects to the airport and surrounding area. The new concrete taxiways have an anticipated lifespan of 20 years, but Peña predicts that they could last longer with continued outstanding preventive maintenance. On a broader basis, he notes that investing in the airfield infrastructure supports continued growth and development of the region's commerce, travel, tourism and trade. Although there was no grand unveiling when the project was done, the airport's commercial and military users were happy to return to their usual taxi routes.